Does anyone know what D212 and the 360r resistor are doing? Are they active while the amp is in R1 mode? This is the last piece in the puzzle in the later III revisions as far as modding to IIC+ specs goes, R2 can be modded to essentially be a switchable ++ mod in the Black Stripe and as far as I know, the Purple Stripe, as they lack this LDR circuit. I'd like to do this as I never use R2 as a separate channel and would get more use out of it as a switchable boost for the lead channel. If LDR6, D212 and the resistor were removed, would this simply delete the circuit or would it do something weird like force the treble shift on? I would imagine D212 is for the LDR supply direction and 360r resistor an attenuator going to ground like how they added a the R2 LDRs originally in the earlier models (compare the III to the IIC+ schematics). This has the additional of a diode and a resistor to ground for the R2 LDRs. NO idea how it works but that seems the most logical thing from a design point of view - adding another LDR/diode/resistor to make sure treble shift is kicked in automatically when R2 engaged. Please someone who knows more about electronics correct me but I think it's pretty safe to remove LDR6 and the corresponding diode and resistor - it basically forces treble shift to be on in R2 mode as far as I can tell and can be removed if you don't want this as you don't use R2 anyway? I wonder if this duplicates the shift settings between R2 and lead, or if forces it on when R2 is pulled regardless of whether the treble shift is pulled. Or put another way, if I have treble shift disengaged, lead mode on, and pull the R2 channel for the gain boost, would that force the treble shift on, or engage the R2 channel without the treble shift? I'll have a mess around when I'm home next. Still very confused by this LDR. I want to phone MB about this, but it's so pricey and I'm not sure he'd know what I was talking about, this seems pretty obscure. It should ALWAYS force treble shift on with R2 pulled, even if you have treble shift disengaged. Simple enough to do some tests and see what happens though without having to phone Mike B - let us know the outcome! Yeah for sure, pretty simple to test out, I've not got access to my amp for a few days but will report back when I'm back home. Those are your independent treble shift relays for lead and rhythym and R2...i believe they are in series on one side so if you snip one you might lose treble shift function. The 360r is a slight current limiting/drop down so as to not tax the already poorly made Vactrols. The reason some models only had one LDR is Treble shift was only assigned to the lead channel. But you could line 10 red stripes up in a row and i guarantee one of them doesn't have that second treble shift LDR! go figure! Ok, after a false start when I had the footswitch on without realising, it sounds like the second LDR kicks on the treble shift when R2 is engaged and the lead circuit isn't on. When the lead mode is pulled, you can engage R2 for the extra gain/changes that makes, without forcing treble shift on. The circuit wizardry this is accomplished by eludes me entirely. I would be surprised if that 360r was having a major, or any, effect on tone. Similarly, I don't see how this system would affect the way treble shift sounds. It's not like the treble shift can stack somehow, there's only one cap and it's either on or off. Someone correct me if I'm wrong there. 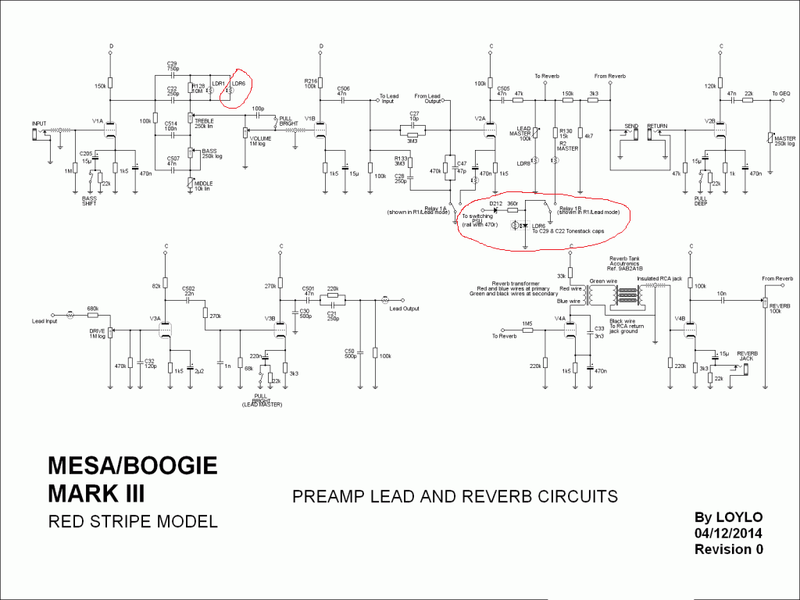 The fact that R2 doesn't automatically kick the treble shift in when lead mode is engaged means it can be kept as a switchable + mod like jrb has done without auto-engaging anything. Basically it just precludes the use of R2 as a slightly dirtier R1. I have no idea how this switching is achieved, but it doesn't seem to have any effect on the lead mode. I'm coming back to my hypothesis that the flubbiness and graininess I'm hearing is because relative to the IIC+ the III has more gain and changed preamp voicing so at similar settings it breaks up more. I get a much tighter sound with the volume at 7 rather than 9 which is the go-to on the IIC+. I imagine the tighter sound I'm hearing with treble shift disengaged is because engaging it adds more gain and contributes to this effect. The next mods I'm doing are to remove all the extra III circuitry, so I'll report back with how it sounds afterwards. it sounds like the second LDR kicks on the treble shift when R2 is engaged and the lead circuit isn't on. When the lead mode is pulled, you can engage R2 for the extra gain/changes that makes, without forcing treble shift on. The circuit wizardry this is accomplished by eludes me entirely. When R2 is engaged does the treble shift push/pull have any effect on the sound or is it permanently engaged? It could be the case! Blue stripes are massively aggressive from what I've heard. One thing on the IIC+ which IS definitely different regarding power compared to the III is that the V1 (first preamp stage), V3 (Lead/Reverb) and V4 (Lead/Reverb) all have a slightly lowered voltage rail going in (D+ on my schematic) which means lower plate voltage which I guess means slightly less break up so you'd maybe need to crank it a bit more? This is achieved with the addition of a 30uF 500V filter capacitor and a 1K resistor. On the III but would involve fitting in another filter cap somewhere and cutting a few PCB traces and running some wires. You get this 'graininess' when treble shift if pulled in lead mode though right? It is basically just switching the tone stack caps from series to parallel, but maybe there's some kind of weird bleed through with the 360r and additional LDR? I'll probably mod my III to have this D+ voltage rail and see what happens when I get the chance. I've basically done all the other IIC+ things to it so can't harm to try! Mine doesn't have the grainy treble shift issue but then again I don't push Volume (labelled Volume 1 on mine) past 7 really... I will push it up to 9 or 10 and see if that makes a difference. Do you still get the graininess on Treble Shift when in lead mode with Volume lowered to say 6 or 7 and Lead Gain cranked up higher to compensate? I thought maybe this meant that pulling R2 doesn't do anything in lead mode and that the difference you hear is placebo since it's a very small difference but I can confirm it still works, if you turn the lead drive down to almost nothing, engage R2 you can hear a gain/tone change. This happens with treble shift both disengaged or engaged. I would be surprised if the 360r was the cause while I've still got all the III circuitry like R133 etc, it's certainly possible it's having an effect but I think most if not all is caused by the extra circuitry in the III and/or the voltage differences. It's mostly mitigated by turning down the volume and compensating with higher lead gain, or disabling treble shift and cranking the volume, but both of these approaches change the gain structure/sound fairly substantially. Higher lead gain loses punch and attack, and a disengaged treble shift makes the attack very spiky. I get closest to the sound I'm after with volume on 7 and the lead gain around 4 but this loses a lot of sustain and I have to play very hard to get it to sound right, and I'm already a very hard player. Wait so treble shift works for you in Channel 1 with Lead off and R2 off? That should NOT be the case! Sure but I don't have the graininess problem, it hasn't been reported on earlier models which haven't been modded, you have the graininess only on Treble Shift and it seems there was some kind of redesign in the circuit regarding Treble Shift on later models? Seems logically it would most likely be caused by that right? Not just the 360R you've got a diode and additional LDR and maybe some other things that Loylo didn't trace if it's doing some switching magic. out of interest, how would you describe the sound differences in yours between 60 and 100w? I actually prefer the sound I get in 60W mode. I also get slightly higher plate voltage. I don't get too much of a change in tone though in 100W mode more just volume. I have the export transformer with switchable voltage set to 240V (UK hasn't yet been standardised to 230V although it says it is officially, although you can get away with 20% variation in voltage either way so not really a big concern). Also completely unrelated but on first inspection of my Mark III I found the 470 Ohm 2W resistors for the output valves were way off value (one had actually burnt in two!) so worth checking, although the amp still did function something wasn't 'right'. I had the same thing as well on my Mesa DC-5 so it's the first thing I check now on older Mesas. I normally replace them with high W wirewound resistors (e.g 6W) Bit off topic but just something that came to mind just then!